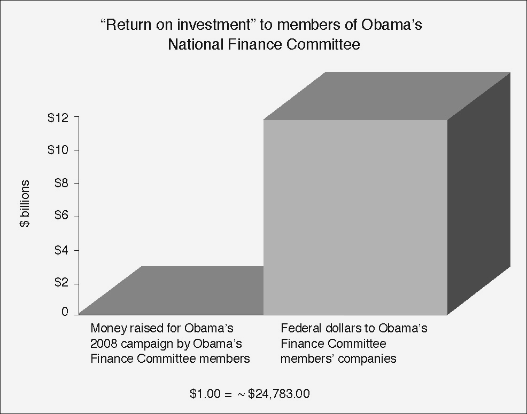 Return on investment for contributions to President Obama’s election campaign. Peter Schweizer’s Throw Them All Out is a good old-fashioned raking of the muck. It’s a catalog of the muck that congress and the White House wallow in when they make money off of their own legislation or the threat of legislation. …the Permanent Political Class has clearly figured out how to extract wealth from the rest of us based solely on their position and proximity to power. If you have a seat at the table, you are in for a feast. If you don’t have a seat at the table, you are probably on the menu. It isn’t just that businesses are attracted to political cronyism because it makes them wealthy. It’s that they must take part or their business will suffer. And it isn’t just that those with connections will lobby to gain advantages over those with no connections. Congress will deliberately create what are called “Milker bills” whose purpose is to ensure that those who don’t take part in cronyism start taking part. Milker bills are often introduced in the area of taxes, says [Professor Fred McChesney, who teaches law at Northwestern University]. Members of Congress threaten to impose a new tax and then withdraw the bill after campaign contributions flow in. Of course, the contributions were the point in the first place. How does it work in practice? Find an industry or a company that isn’t paying much attention to politics, and make laws about them. If you pay any attention to the news, you probably heard a lot about hedge funds around 2006-2007. In the summer of 2006, Senate Majority Leader Harry Reid [D-NV] announced that he wanted a tax hike on hedge funds… In late January 2007, shortly after the Democrats had captured both houses of Congress, Senator Charles Schumer [D-NY] sat down to dinner with a number of top hedge fund managers at Bottega del Vino in Manhattan… hedge funds up to this point had spent very little money on lobbying and campaign contributions. They were quite content to be left alone by Washington. But Schumer, who headed the Democratic Senatorial Campaign Committee, wanted to change that. And with the threat of a tax increase, suddenly the hedge funds became very generous. Then, in the late fall of 2007, Senator Reid and his colleagues suddenly changed their tune. The Senate schedule, it seemed, was just too crowded to deal with the issue. The threat of a tax increase for hedge funds was withdrawn. When congress starts talking up their worries about a company like Google, or an industry like credit cards, it’s as likely that they want contributions as that they want laws. Nancy Pelosi managed something similar with Visa. After the Credit Card Fair Fee Act of 2008 was introduced, she got in on the very lucrative Visa IPO. IPOs are very difficult to get into. Most people have to wait until a company’s stock starts trading to buy it, but “Pelosi and her husband have been involved in no less than ten lucrative IPOs during her congressional career”. After the Pelosis received the Visa IPO, the credit card bill never made it to the House floor. You might remember that there was a credit card reform bill that passed the House: it was a bill that focused on banks, not on Visa as the original bill did. None of this affected Visa, however, only its client banks. Interchange fees were not touched, though the bill contained a vague clause stating that the issue should be “studied.” Little surprise, then, that Visa stock went up when the bill passed. Having squelched legislative action on interchange fees for more than two years, Speaker Pelosi and her husband saw their Visa stock climb in value. The IPO shares they had purchased soared by 203% from where they began, while the stock market as a whole was down 15% during the same period. The nice thing about such shakedowns, from the politician’s standpoint, is that they don’t just bring in more campaign cash, they also bring in more work for other politicians and their friends, what I called the bureaucracy event horizon. The political class also profited indirectly, because the hedge funds hired lobbyists, often the friends and former aides of politicians, to fight the bill. The more people who are involved in it and have a stake in it, the harder it is to reform it. Some of the worst examples come from the 2008 financial crisis. But politicians didn’t feel it financially like the rest of us did. One reason is that the crisis was partially brought on by government-sponsored entities Fannie Mae/Freddie Mac failing—except, of course, that they didn’t fail. They were bailed out by congress. A congress whose members traded in their stock. [Congressman Spencer Bachus, R-AL] netted tens of thousands of dollars in capital gains, while most Americans watched their portfolios plummet. A lawyer and a former state senator, Bachus has served in Congress since 1993… Bachus had impeccable timing. In over two dozen cases, representing more than two-thirds of all the trades he made, he guessed correctly. Consider for a moment the fact that the political class regularly trades stock in government-backed entities like Fannie Mae and Freddie Mac while at the same time determining the fate of those very entities. This is insidious. What it means is that these companies—and the politicians who profit from them—don’t suffer when the economy suffers from their mistakes. Private businesses usually prefer a rising economy, because a rising economy helps them profit. It doesn’t matter that a rising economy also helps their competitors profit. But “crony capitalists do not depend upon the general success of the economy to achieve their goals.”1 The businesses depend on bailouts, guaranteed loans, and grants from politicians—who use tax money, not their own money, to provide those funds. And the politicians depend on getting something back (perhaps ahead of time) for those funds. Companies make relatively small contributions to politicians or to their campaigns, and receive many times that in government funds back to their businesses. The first guaranteed loan provided by the Obama administration for alternative energy was massive: $573 million for a solar energy company called Solyndra. The company got a low interest rate and the knowledge that if it could not repay what it owed, the government would pick up the tab. In short, a very nice deal. President Obama paid two visits to Solyndra’s California factory to tout the grant. As it turned out, 35% of the company was owned by an Oklahoma billionaire named George Kaiser, who was a bundler2 for the 2008 Obama presidential campaign. The economic reality is that Solyndra loses money on every solar panel it sells. The company has never been profitable. The plan was simple, and would become a pattern with other companies: secure government money, go public, and get out. The basic idea isn’t new. “But what has changed in recent years is the amount of money involved, and the power of the federal government to move markets and make people very rich.” The power and money accelerated sharply with the 2008 bank bailout, which combined massive amounts of money and massive federal power to keep the rich massively rich despite their own mistakes. On the eve of a second TARP vote in the House, Buffett moved toward the fire again when he bought a $3 billion stake in corporate giant General Electric4… Eventually it would need $140 billion in taxpayer capital to stay afloat. That’s a strong part of what makes cronyism a danger to our economy: cronies are successful because they can influence legislation, not because they’re making sound decisions. And when their unsound decisions cause an economic crisis, they are not accountable and it’s not a crisis for them. Throw Them All Out is a great book, examining what may be the central problem of our current economy. I strongly recommend reading it, and keeping it for reference in future elections. A “bundler” is a person who coordinates individual contributions and combines them into large gifts. Far fewer jobs were created than were lost as a result of the BP oil spill. That’s what happens when a company thinks the government will bail them out: they get sloppy. And in return, government regulators also let things pass that they wouldn’t otherwise let pass. General Electric’s financial arm, GE Capital was in big trouble. If you enjoy corporate cronyism, you might also be interested in Atlas Shrugged II: The Strike, Tax individuals, not organizations, No corporation pays taxes, Simplifying taxes into complexity, Christian values at the point of a gun, Money more important than safe intersections, Government oxymoron: anti-corruption laws, Public Citizen lies to its own supporters about single-payer health care?, The rich get richer because of big government, Sarah Palin’s Gordian Knot: Slicing crony capitalism, Governor Perry and the role of government, The Parable of the Primary, Why is the media saying Sanders lost the debate?, Crony vs. Crony, Business prospect incentives discourage innovation, Catastrophic Care: How American Health Care Killed My Father, Eugenics and Other Evils, Socialized gasoline: The bureaucratic miracle of Vehicle-to-Grid, President Obama talks about NCLB, and U.S. PIRG supports Ryan budget plan. If you enjoy corruption, you might also be interested in Essential revolution: fight corruption, Stop the rot—with sunlight and sunset, Government oxymoron: anti-corruption laws, A tale of two negotiators, and Pennsylvania AG says crime is racist. Throw Them All Out last modified March 27th, 2012.